Chris Gayle (right) receives a plaque from University of the West Indies (UWI) Vice Chancellor Professor Hilary Beckles during the innings break of the one-off day/night 50-over match between a UWI Vice Chancellor’s XI team and Bangladesh at Sabina Park. Dr.Akshai Mansingh, Dean of the Faculty of Sports at UWI, Mona looks on. Gayle and Patrick Patterson were honoured by the UWI for their contributions to cricket. Destructive opening batsman Chris Gayle and former West Indies pacer Patrick Patterson were honoured by the University of the West Indies (UWI) for their contributions to cricket on Thursday. The two Jamaican honourees were recognized during the innings break of the one-off day/night 50-over match between a UWI Vice Chancellor’s XI team and Bangladesh at Sabina Park. Before a small but appreciative crowd, Dr Akshai Mansingh, Dean of the Faculty of Sports at the UWI, Mona, read tributes to both men – first Patterson, who was absent, and then Gayle. 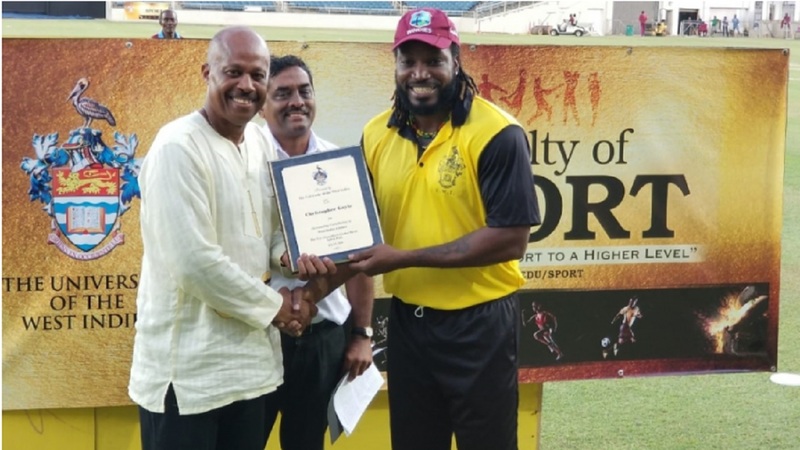 Bangladesh coach Courtney Walsh, a past honouree, collected a plaque on behalf of Patterson his one-time bowling partner from UWI Vice-Chancellor Professor Hilary Beckles, who also presented Gayle with his. “It means a lot. I just want to thank the University of the West Indies, Professor (Hilary) Beckles and the entire team. It’s good to be recognized. 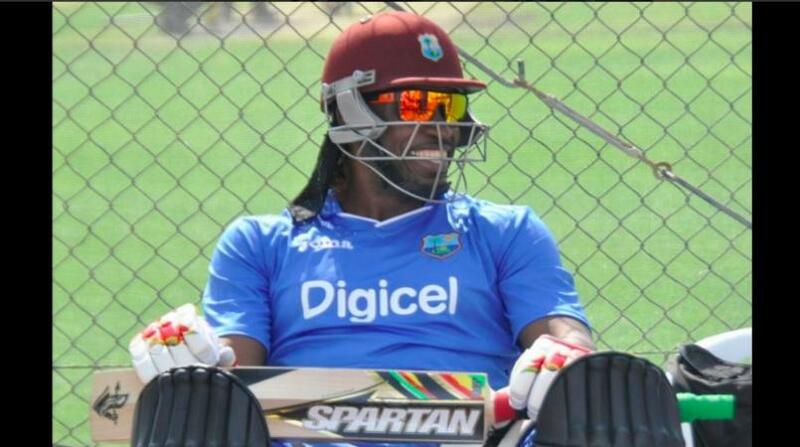 I am very thankful for that and hopefully set more standards, set more records before I actually depart from the game,” said Gayle. He said he was disappointed that Patterson was not able to make it to the ceremony but happy that he was able to be honoured alongside the long-retired tear away Windies quick. Of note, it was Gayle's 138 playing for the Vice Chancellor's XI back in 2003 that propelled him back into the Windies team after being out of the squad for two years. Bangladesh beat the UWI Vice Chancellor’s XI by four wickets with Gayle getting 29. Bangladesh will now concentrate on the three-match One-Day International (ODI) series against West Indies starting in Guyana on Sunday. 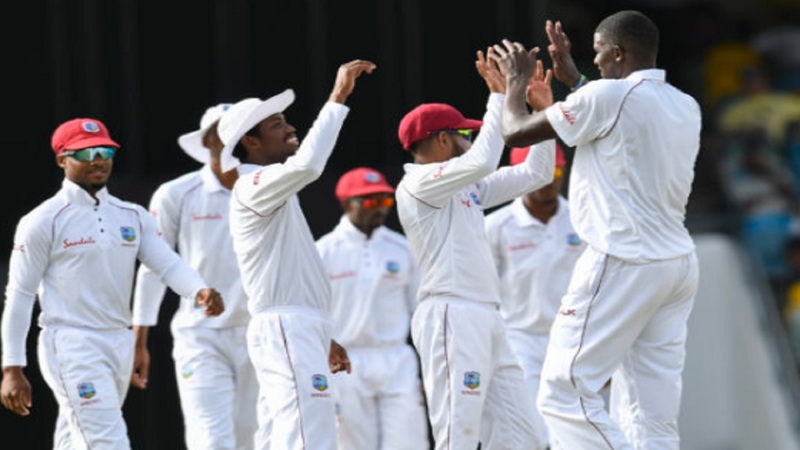 West Indies recently swept the Test series 2-0.